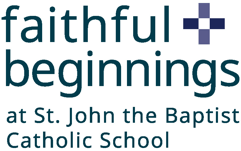 St. John the Baptist School has a strong tradition of love for one another and support for others. We want to continue that tradition in all that we do as a school in our daily activities as well as through our connections with our larger community. We consider our relationships with alumni an important part of our history and would love to stay in touch with you. See the alumni links to get the latest news, find out about our scholarship program, read about ways to get involved at St. John’s School and update your information. Christ’s Peace to you! St. John’s Alumni Questionnaire – Click here to complete the form. St. John’s Alumni have represented 10 JHS Valedictorians since the year 2000!